THIRUVANANTHAPURAM: It’s not every day you get to see a massive Antonov An-32 up close. On Friday, 800 school children got a chance to see not one, but three of the massive transport aircraft, climb inside them and interact with the pilots. School children were allowed inside the Air Force Technical Area of the Southern Air Command at Shangumugham on Friday as part of ‘Know Your Forces’ programme. “Eight hundred children came on Friday. We are expecting another 900 on Saturday,’’ a defence spokesperson said. And it was not just the An-32s that the youngsters got to eyeball. An Advanced Light Helicopter (ALH Dhruv) used by the IAF’s Sarang aerobatic team and weapons, including small arms, were on display. 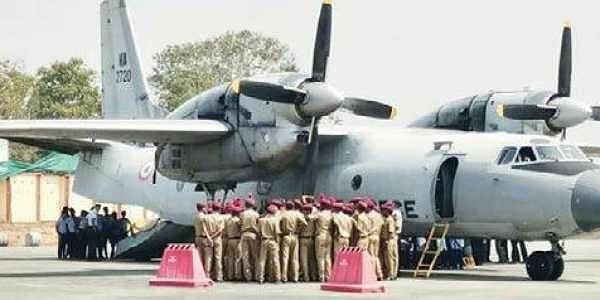 During the recent search and rescue mission ordered in the wake of Cyclone Ockhi, the An-32s and the Sarang helicopters had scoured vast swathes of the Arabian Sea for missing fishermen. Friday’s event was organised to generate awareness about the Indian Air Force, the defence spokesperson said.